Sept. 24, 2009, 10 a.m.
By Zachary M. Seward @zseward Sept. 24, 2009, 10 a.m. 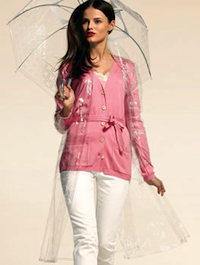 In his monthly memo to staff yesterday, Times president Scott Heekin-Canedy, channeling the Style section, called the ensemble “a summer sensation for The Times Store.” The umbrellas have sold out, and the rain coats (sold separately for $65) are in short supply, though I’m told more of both are on their way. The items were produced exclusively for the Times, but neither has the newspaper’s branding on it. Though hot-selling merchandise will hardly cure the Times Co.’s cashflow woes, the collaboration with Mizrahi points to potential revenue streams for news organizations selling tangible, private goods. The Globe and Mail, in Toronto, sold out 500 spots on a luxury cruise with its journalists last year. And The Telegraph, in London, has found success selling items from tulips to panama hats. Obviously, newspaper stores aren’t just for framed reprints anymore, although Heekin-Canedy noted that a 40th-anniversary edition of the Times’ famous “Men Walk on Moon” front page, signed by Buzz Aldrin, was “one of the store’s most popular items” this summer, despite a $795 price tag. The Times first collaborated with Mizrahi earlier this year, when he produced a silk scarf and leather hand bag in a warm palette that Adolph Ochs might have found garish. (A recent Times review of Mizrahi’s work described it as “awash in gorgeous color.”) The hand bag included a gothic “T” medallion on its handle, a subtle form of branding that’s absent from the rain gear. In addition to its Times Store wares, the newspaper recently launched a wine club at $90 or $180 for six bottles. (The Wall Street Journal and USA Today are also hawking vino.) In his memo, Heekin-Canedy said that Times employees, many of whom absorbed a 5-percent pay cut earlier this year, can get a 30-percent discount on their first shipment from the club. POSTED Sept. 24, 2009, 10 a.m.
Seward, Zachary M.. "Gray Lady couture: New York Times has a fashion hit." Nieman Journalism Lab. Nieman Foundation for Journalism at Harvard, 24 Sep. 2009. Web. 18 Apr. 2019. Seward, Zachary M.. "Gray Lady couture: New York Times has a fashion hit." Nieman Journalism Lab. Last modified September 24, 2009. Accessed April 18, 2019. https://www.niemanlab.org/2009/09/gray-lady-couture-new-york-times-has-a-fashion-hit/.